Anti-psychic Kitty poses for an Occupy Bolingbrook picture. The most skeptical creature on Earth and columnist for The Babbler, Anti-psychic kitty is now the leader of Occupy Bolingbrook. A self-described fan of The Babbler, Finn said Anti-psychic Kitty was an obvious choice for the general assembly. “All three, I mean all of us, like his work. He’s the smartest columnist in Bolingbrook. Plus his anti-psychic powers will prevent Roger from using psychics from spying on us. Not that we have anything to hide, except where the first camp site will be. We want him to be surprised when we pitch the tents! Finn also hopes that Anti-psychic Kitty will use his column space to promote the 99 Percent movement. Anti-psychic Kitty, speaking through a facilitator communicator, accepted the position. Occupy Naperville considers expanding to Sundays. Sources with friends within Occupy Naperville say the group is considering marching adding Sunday marches to their schedule. Dawn says the Sunday marches should attract more participants. Joan, a long time resident, hates the critics who question why Occupy Naperville doesn’t have a camp site. 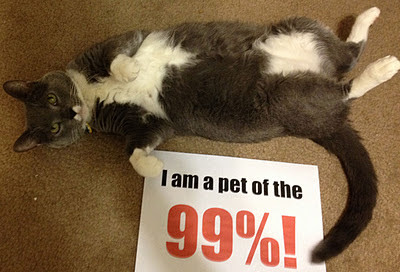 The part time protests are still too much for some residents. What was expected to be a peaceful general assembly turned into verbal clash with the local skeptical community. The interruption irritated some of the occupiers. After several exchanges, Occupy Chicago tabled the resolution on alternative medicine. The “Occupy Chicago Skeptics Pub” promised to be back. Not all were upset with the pub of skeptics. A spokesperson for the Chicago Skeptics denied any involvement with the pub.